The key problems of the Crimean Tatars, which they face due to the occupation of the Crimea, and the role of European institutions in restoring Ukraine’s sovereignty were discussed by member of the Bundestag, member of the Social Democratic Party of Germany Johannes Schraps, head of the Mejlis of the Crimean Tatar people Refat Chubarov and other members of the representative body of the Crimean Tatars. The meeting was held in the office of the Mejlis in Kyiv, QHA correspondent reports. The German MP, who is a rapporteur on Ukraine and the Eastern Partnership in the Bundestag Committee on the European Union, was interested in how the Mejlis now operates, what the situation is with respect for the rights of the Crimean Tatar people in occupied Crimea and mainland Ukraine. Johannes Schraps stressed that in Germany everything that happens with the Crimean Tatar people and its representative bodies is closely monitored. That is why German politicians, including members of the Bundestag, have repeatedly met with members of the Mejlis. Refat Chubarov told Johannes Schraps that from the first days of the occupation Russia saughts support of the Crimean Tatars, but their massive rejection led to repression against the indigenous people of the peninsula. One of the manifestations of such repression is the fact that the Mejlis is forced to function in exile in Kyiv, and many of its members cannot enter the Crimea. In particular, out of 33 members of the Mejlis, ten live in mainland Ukraine. Chubarov also reminded the German MP that Russia has not yet fulfilled the last year’s order of the International Court of Justice to lift the ban on the activity of the Mejlis. Refat Chubarov praised the position of the Bundestag on the issue of maintaining the territorial integrity of Ukraine, despite the fact that the Bundestag itself is constantly discussing relations with Russia. In his opinion, Russia's actions to destabilize Europe, first of all, are directed against Germany, because of its principled position in the Ukrainian issue. The Head of the Mejlis noted that the Social Democratic Party of Germany is in search of a line of action in order to maintain the existing sanctions and pursue a dialogue with Russia. Chubarov asked Schraps to convey to his party colleagues that attempts to seek dialogue with Putin, without voicing demands to return to the framework of international law, will always be perceived by the Russian head as a weakness of Western democracy. The visit of the Member of the Bundestag of Germany Johannes Schraps to Kyiv was organized by the Friedrich Ebert Foundation in Ukraine. 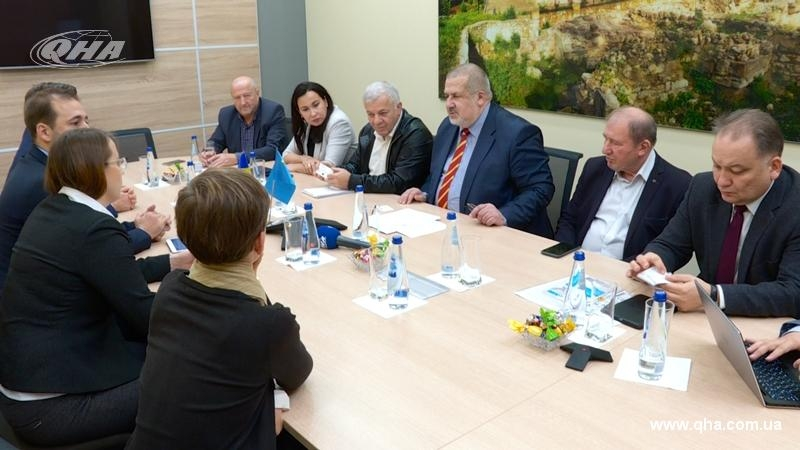 Recently, the leadership of the Mejlis of the Crimean Tatar people met with a member of the board of the Friedrich Naumann Foundation for Freedom, Sabine Leutheusser-Schnarrenberger.